Discussion in 'French-English Vocabulary / Vocabulaire Français-Anglais' started by iaorana, Dec 16, 2015. "Un petit coucou en passant"
"...by passing by" insinue "le petit coucou" est seulement possible avec des certains circonstances. Welcome to the Forum, ioarana ! Can you please describe in more detail the context in which this is said? Who says it to whom, in what situation? I personally would say : Just dropping by to say Hi! Merci beaucoup de m'avoir répondu. C'est très gentil à vous. C'est tout simplement moi qui voulait saluer une amie américaine et je voulais lui envoyer le message sms suivant: "un petit coucou en passant" mais je me suis rendu compte que je ne savais pas le dire d'où ma question sur ce forum. Je voudrais aussi féliciter les concepteurs de wordreference et les participants qui répondent aux questions posées sur le forum comme vous. I'd still say "dropping by" - to render the same idea as « en passant ». As on this card (one of many of the kind). The person sending it is not really "dropping by". Just as you can "drop a line", I think you can "drop a text message". I am not a true native english speaker but I always thought that it didn't matter if we were truly dropping by and that it was just one of these set formulas that everyone says. In the expression above, I like the rhyming tones which is why i voted for it. If it is a set formula for a casual greeting it's not one I've ever come across. If I received a message "Just dropping by to say 'Hi' " I'd reply "When?" I agree. I actually purchased greeting cards with exactly the same message! Ok, but that's nothing to do with dropping by, which is intransitive! I agree with Itisi. Dropping by implies physical presence for me. As an anglophone, I would never say "just dropping by" unless I was physically present. Of course we can say : Just wanted to say hi/hello (je voulais juste te faire un petit coucou) but it's missing « en passant ». Yes, that's what I like about it! I wouldn't "drop by" via text message, either. It definitely suggests a physical presence--perhaps the card is acting that presence, but that's not what people would say spontaneously in a text message exchange. Just saying hi while I'm at it comes to mind for that context. 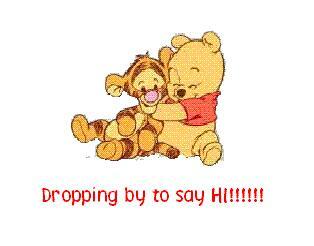 while drop by is intransitive in "Just dropping by to say Hi!" it can also be used transitively. Same thing for this francophone. But it apparently isn't the case. My mistake. Still... I wouldn't bet my last dollar that nobody says - or rather writes - "Just dropping by to say this or that" unless they are physically present. May be those who do are all "non natives". I deleted my two previous posts. Sorry for those who quoted me. Nico, sorry, but <drop by a friend's house> is not a transitive use; 'house' is not the object of 'dropping by'. - "Just a quick hello". That's close to Nico's (now deleted?) "Just wanted to say hi/hello". I wouldn't try to translate "en passant" directly. "Just a quick hello in passing" would be possible, but for me it would detract from the greeting, as if it were incidental and I sent it only because I happened to have my phone out for something else. For me, "Just a quick hello" covers both the ideas of "petit" and "en passant" in the original. I guess you and I use that phrase differently, wildan. If you sent that to me, I'd wonder "while he's at what?" I might use it in a context such as "I'm updating my contacts list, and I thought I'd just say hi while I'm at it." really "drop by, by a friend's house" (which would sound very odd), and the two occurrences of "by" have been fused into one, having two separate functions. Anyway, as you said, Nico, that doesn't apply to iaorana's example. I understood that the original question was just that, Wordsmyth--during a text message exchange (which I assumed was about some topic or piece of business), a greeting was added "while she's at it." I like that solution, Ws. Incidentally, I reacted the same way you did to Wildan's "while I'm at it". I regretted deleting my post. So for those interested, this is what I had written. Good point, Itisi. My example (to drop a line) wasn't a good one. But it is by extension that we say it (at least on this side of the Atlantic) even if we're not actually "dropping by" physically. Which is also the case for the French « en passant », by the way. Given her initial attempts, I thought iaorana was looking for a way to translate « en passant ». Since I didn't like the literal "while passing by / in passing", I tried something else. Would "Just popping in to say Hi!" have been a more suitable possibility ? Having seen all the ensuing discussion I'm now more convinced than ever that a message simply saying "thinking of you!" should suit iaorana's purpose perfectly. All this talk of "dropping in/by", "popping in" and "while I'm at it" (at what?) seems quite inappropriate. Another possibility would be "Hi! " or even just a minimalist " "
None of the words in iaorana's original phrase needs to be translated literally. It's the usual challenge for translators - what needs translating is the ideas, not the words, and the words can often lead you up the garden path. I agree with broglet (to stick an oar in)! Had iorana wanted to write « Je pense à toi » or « Salut ! », she wouldn't have enquired about « Un petit coucou en passant ». and remind old translators - as if they didn't know - that a literal translation doesn't always work. A real - and totally wrong - literal/word for word translation would have been : A little hello in passing. But this is not what I initially suggested. Note to self : Nico, don't bother trying to translate French -> English. Leave that to the anglophones who know better. Just dropping by / popping in to say Hi! I move back to my : Just wanted to say hi/hello (je voulais juste te faire un petit coucou). I'm officially off this thread. And this time, I mean it. (Ahem, and to mine at #15). This comment will probably be deleted by a moderator but... what would the collective noun for translators be? A quandary, perhaps? Or a rumination? ...those people who write on Twitter, blogs, forums, etc. : Just dropping by / popping in to say Hi! I suppose they consider forums, etc, as locations in space; but an sms, a letter, a card cannot be considered locations (well, that's how I see it...). You know the rules, Carcassonnaise, you should open a new thread for this question! Ah, I see now. I'd assumed "Un petit coucou ..." would be the opening phrase of a message. Well, dictionary writers are only human, and therefore fallible (some more than others). In this case I think the 'transitive' definition must have been added hurriedly, or at least without much thought. But it doesn't really stand up to analysis. I know you said you're off this thread, Nico, but ... I'd have the same problem with "popping in" as with "dropping by" (the physical presence thing). But for people who happily drop by via card, mail or phone, then "popping in" would work just as well. @Ws : You know I keep writing that I'm off a thread... and then can't resist the urge to come back. So, thank you. . I think... to stick another oar in... that translation is not about "translating words as they appear on a page", but rather about translating a natural thought in one language into an equivalent (ish) natural thought in another. dropping by/popping in to say Hi ! were "natural thoughts" as you put it. That they were sort of "set formulas" as Saints22 wrote (post 11), with or without the physical presence. Now, I know better. Hence my writing - although it took me a while, I admit - that I should stick to English -> French (which is 95 % of my translator's job). And mind my own business if the question is the other way round. @ itisi : sms, cards and letters aren't locations by themselves, but they are usually sent to a location. Are they not ? For me, "Just a quick hello" covers both the ideas of "petit" and "en passant" in the original. More so than Thinking of you or a simple Hi! in my opinion.